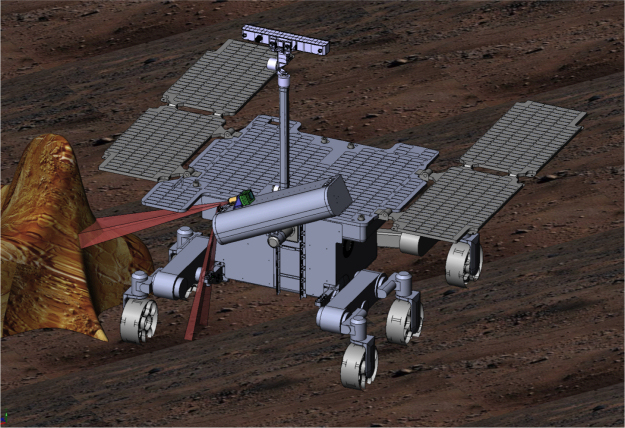 The Close-UP Imager (CLUPI), part of the instrument payload on the ExoMars rover, will be a camera system designed to acquire high-resolution, colour, close-up images of outcrops, rocks, soils, drill fines and drill core samples. The imager is located on top of the drill box, shown here in the centre of the picture at an angle to the rover. CLUPI relies on the movement of the rover, and the degrees of freedom of the drill box, to image areas of interest. The reddish lines show different fields of view of CLUPI.